Navigate to <Hadoop-Installation-Directory>/src/contrib/eclipse-plugin. Following highlighted files will be modified. Lets us first see, what happens if we try to build Hadoop Eclipse plug-in from the provided source code. Above echo message indicates that eclipse.home is not set and build of the plugin is skipped. 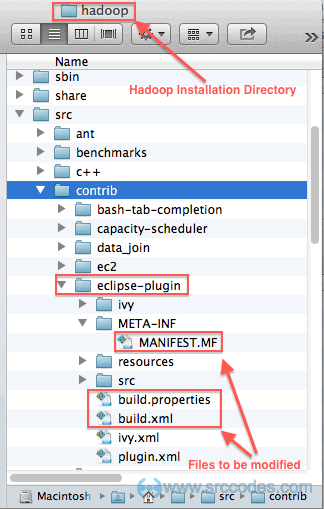 Open build.properties in a text editor and set eclipse.home with your Eclipse / STS installation directory. Also define version of different jars required by Hadoop Eclipse plug-in. Now eclipse.home is set, but we are not done yet. To find out why, try ant build once again. This time we will get java compilation errors as shown below. Open build.xml and modify path (id="classpath") and target (name="jar") as highlighted below. Note : Hadoop Eclipse Plug-in code is dependent on Hadoop jars. So it is required to add those in classpath of 'compile' target. Also we need to include jars required by the eclipse plugin in 'jar' target. Open MANIFEST.MF in text editor and modify Bundle-ClassPath as highlighted below to incorporate the changes made in build.xml. Copy Hadoop Eclipse Plug-in jar (hadoop-eclipse-plugin-1.2.0.jar) and paste it to <Eclipse-Installation-Directory>/plugins directory. Start / Restart (if already running) Eclipse / Spring Tool Suite IDE. Navigate Window --> Open Perspective --> Other and select Map/ReduceOpen perspective. 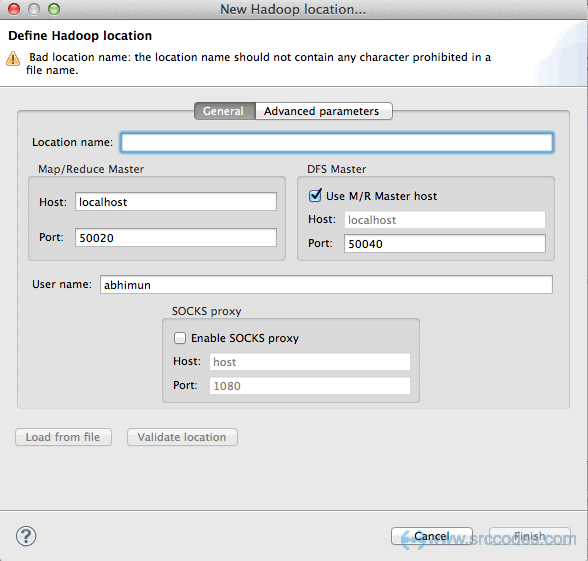 You'll be able to see Map/Reduce Locations window where New Hadoop Location can be added. Now, Eclipse environment for Hadoop is ready for you to explore.